The grand production values alone make François Girard’s latest film one to watch, particularly for Nicholas Bolduc’s gorgeous cinematography that gives the film its remarkable grandeur, but the ingenuity of Hochelaga and the inclusivity of its retelling of history are the facets of the film that impress the most. Hochelaga mirrors Girard’s The Red Violin with its tale that spans different periods of history to see the life that treasured relics hold and the cultural lessons they share when they pass from one hand to the next. Whereas The Red Violin is an international affair that trots the globe while the titular violin travels from port to port, Hochelaga remains firmly in the land we now call Canada for 100 minutes of story time that span over 750 years. The film looks at the history of Canada by zeroing in on one part of the country the size of a football field. Hochelaga explores a sinkhole that gorges the Molson Stadium at Montreal’s McGill University and tragically swallows one of the football team’s star players (Roman Blomme) in its wake. The rare occurrence becomes a research opportunity even rarer for restless archaeology student Baptiste Asigny (Samian), who excavates the site in search of evidence of the Iroquois village of Hochelaga where Jacques Cartier and the Iroquois are believed to have made contact in 1535. X marks the spot for an epicenter of Canadian history as Hochelaga explores the many lives that have crossed his part of Montreal throughout the ages. The film spans from the pre-contact years to present day, and the expansive scope of the film puts Canada’s settler history under the microscope. The souls of the Iroquois haunt the land with a breathtaking narrative that Girard intercuts throughout the film and shows Hochelaga with the original inhabitants of the territory. This sequence features an Iroquois prophet (Raoul Trujillo) guiding the lone survivor of a bloody battle that leaves many bodies scattered around the land. The sole living warrior from the fight is Asigny (again played by Samian) who receives the elder’s wisdom that this land should not be one of war, battle, and violence. Evocative music by Gyan Riley and Terry Riley draws upon Indigenous influences and lets the elder’s prophecy haunt the future walkers of Hochelaga’s terrain. The lives of these early souls echo throughout the film as Asigny and his team dig away through the field and discover artefacts from the past. An iron plate from a stove, for example, whisks us back to 1687 for a tender love story between a French settler named Étienne Maltais (Emmanuel Schwartz) and an Iroquois woman named Akwi (Tanaya Beatty) during the outbreak of a deadly plague that claimed many lives during Montreal’s early days. This sequence tackles the divides of faith that arise as Maltais succumbs to the purple fever in a Catholic hospital and is guided only by his love for Akwi and the power of a necklace she gives him, which provides spiritual comfort akin to a crucifix. It leaves the doctors and nurses fretting about a soul that strayed to the “savages,” although the finale of the film illustrates lost souls from all walks of life who converge on the field in a frenzy akin to Birdman’s latter act rim shot. The significance of material things returns when Asigny discovers some old rifles and unearths a tale of treason told through an episode involving the Patriots and the Loyalist Army during the rebellion of 1837. Ditto the find of a crucifix that introduces the sought after Jacques Cartier (Vincent Perez) who brings gifts to the Iroquois chief (George Wahiakeron Gilbert) who humorously is misinformed of their perceived significance. 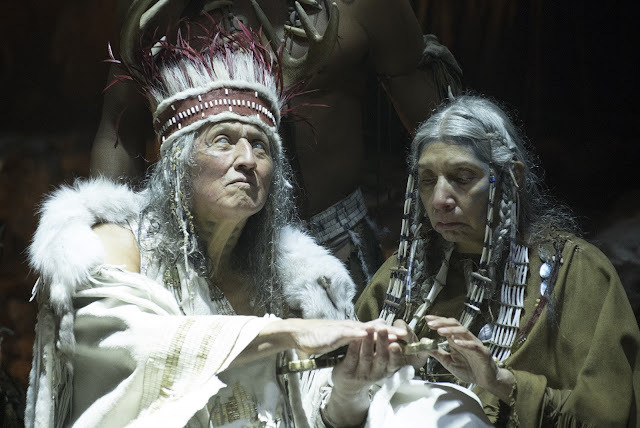 The play on objects and things in Hochelaga marks the traces of history erased by Canada’s colonial past as few relics from the pre-contact days preserve the stories of Indigenous lives and cultures with the same respect as the heirlooms of the settlers. The filmmakers make ample attempt to be respectful of the Indigenous legacy by offering dialogue in Mohawk in addition to French and English, while the characterization avoids recycled stereotypes and clichés. Girard’s The Red Violin is one of the few Canadian dramas ever to win an Oscar and his new film Hochelaga, Land of Souls could very well scoop another if the Pan-Canadian committee selecting our Best Foreign Language Film contender submits this film either this year or the next. Given that 2017 is our Sesquicentennial year, however, it might be an appropriate to fast track the release of this excellent drama that looks at a land and the history of its inhabitants who have been here far longer than 150 years.